Looking for a web site that has lots of different products all in one place?! Well I've found it on CSN Stores.com! They really have everything you can think of... 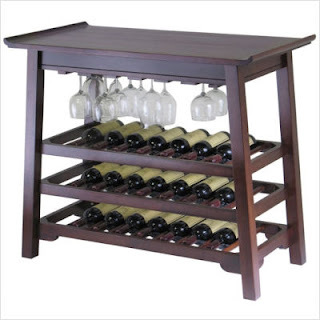 I found everything from wine racks to rugs to kitchen utensils all with just a click of a mouse! I was recently given the opportunity to review a product from CSN Stores.com and I knew that I wanted something for the kitchen (specifically a new coffeemaker) and I was pleasantly surprised by the many varieties (and name brands!) that were offered on CSN Stores.com! I enjoyed being able to read product reviews directly on the web site - and the site has an easy navigation feature that helps you narrow your search results so you can find exactly what you want! 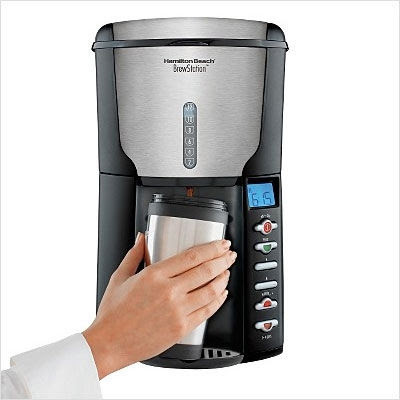 I chose to review the Hamilton Beach 12 Cup Brewstation. This is an awesome coffee machine! The preparation is very similar to how you would make coffee in a traditional pot, but it dispenses in the front of the machine. (Just like a water dispense on a refrigerator!) You just hold your cup up, press it to the lever, and the coffee pours directly in your cup! No mess, no glass carafe to worry about and the coffee stays HOT! This is especially great if you have two coffee drinkers in your house that don't get up at the same time. The coffee maker itself looks really sharp! It matches my stainless steel appliances perfectly and has the look of a high end coffee maker at a moderate price. I have had it about a month and have not had any problems with it. It is a little on the big side, but I think it adds to the high end look. It's definitely a quality product! But the best thing about this product was that it shipped FAST! It came to my house in can you believe this about 2 days! 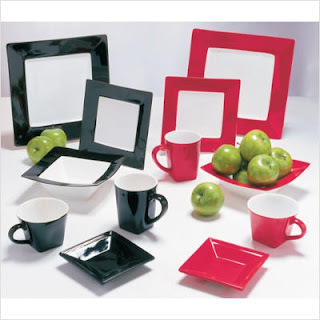 Verdict: CSNStores.com is a great place to shop online for furniture, home decor, housewares and more! WIN IT! One lucky Frugal & Fabulous reader will win a $60 gift certificate* to CSNstores.com! 3. Enter one of my other current giveaways and come back and tell me which one you entered! 5. Add my button or link to your blog/site! 6. Follow @lindsfrugalfab and @CSNStores.com on Twitter! *Updated* You have until Friday, July 2 @ 7pm EST to enter! (Winner must respond within 48 hours.) Giveaway open to U.S. residents only. Disclaimer: I was provided with a gift certificate towards my purchase in order to write this review. All opinions are my own. *shipping is not included in the gift certificate. I am an email subscriber to your blog! Also, I follow your RSS feed via Google Friend Connect! I follow @lindsfrugalfab on Twitter. Also, I follow @CSNStores on Twitter. Facebook fan of Frugal and Fabulous! I would buy a playhouse for my son! If I won, I would buy the Emerson 50" Pro Series Ceiling Fan in Weathered Bronze for my bedroom! Entered the Chunky Bling giveaway! My favorite item at CSN is the Fisher-Price Loving Family Grand Dollhouse. I follow you and CSN Stores on Twitter @mami2jcn. I like the JoJo Designs Black and White Floral Tote Handbag. I'd get the George Foreman Next Generation Grill. I'm subscribed via Google Reader. I would love to win the Le Creuset Baking Dish Set in Caribbean. I entered this giveaway: Chunky Bling Customized Watch. I would get the Omega Paw Roll'n Clean Litter Box. My son would love to have the Guidecraft 4-In-1 Flipping Table Easel and I need some kitchen tools! Choppers, slicers and bakeware would all be great! I love CSN stores too! I would get the little tykes sand and water fun factory table! I subscribe to your site via e-mail! I am your facebook fan! I'm a current subscriber via google reader. I'd get the Radio Flyer Little Red Scooter. I would get the KidKraft Parking Garage! I entered the chunky bling contest! You blog is linked on mine! I would totally use this gift card toward a nice, designer cat box...The one we use now is so ugly! I've had my eye on the Fagor Electric Multi-Cooker for along time. I'd put the $$ toward that for sure! Thanks so much for the chance! I'm a facebook fan of CSN Stores. CSN has some CUTE shoes! I would go for some of those! I would like to get JoJo Designs Soccer Pink Kid Bedding Collection - SoccerPink-Series for my daughter's bedroom. Thank you for the giveaway. I am an email subcriber. Thank you. I follow your blog via Google Friend Connect. Thank you. I follow you and CSN Stores on Twitter (nanatide). Thank you. I am a fan of yours and CSN Stores on Facebook. Thank you. Thanks for this opportunity! Love CSN. I would buy me some new shoes if I won! I'd use it towards the Radian65 car seat!! I like the Howard Miller Brentwood Wall Clock. I really want a food processor. They have a mortar and pestle set that I've been eyeing! I read your blog every day. Love it! My favorite is the KitchenAid Artisan stand mixer. My Name is Jenni and I would love to get the Samsonite Padma Spinner 22". I follow Google Friend Connect. planetarium play tent for my kids. I would like to get the Uttermost Betsy Table Lamp in Mocha Black (Set of 2). I'm your Fan on Facebook. I would use the CSN gift certificate towards the purchase of a new kitchen faucet! I follow you and CSN on Twitter! I love the Mauviel M'héritage mini 3.5" Saucepan! I follow both on twitter! I am a FB fan of both! My favorite item is the Eames rocking chair! I've wanted one for years! 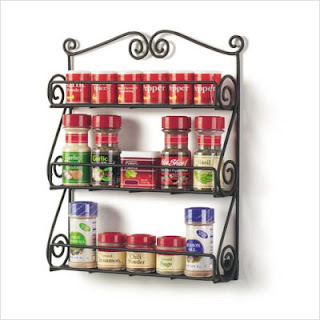 I love the spice rack! I really want a ice cream maker. Following you and CSN on twitter @suburbsanity. Fanned Frugal and Fabulous on Facebook. Tough decision! I would choose either the Dr. Scholl's Scream sandals in Black or the Dr. Scholl's Original in Taupe Snake. I subscribe to your blog feed via email. I subscribe to your blog feed through Feedburner. I am following your blog on Blogger (username Nelsby). Thanks! I am following you on Twitter (@Nelsby). I am following @CSNStores.com on Twitter (@Nelsby). I am a Facebook fan of CSNStores.com (Aimee Waerhouse). My fave item at CSN is the Jaccard Safe Hands Mandolin! I have used csn baby before...would love to get some more childproofing gear! I entered the fashion to figure giveaway! I follow you & CSN on twitter. I also entered your fashion to figure giveaway. I have my eye on a trunk/coffee table. I subscribe to your feed w/Google Reader. I follow @lindsfrugalfab and @CSNStores.com on Twitter as "calidreamin87"
I'm a fan of Frugal & Fabulous on Facebook. I'm a fan of CSNStores.com on Facebook. My favorite item right now is the Kalencom diaper bags!